To really deal decisively with a problem, first you have to understand it. Really understand it. In England we have an issue with some migrant anglers from eastern Europe not abiding by our conservation-based angling law and rules. It is widely believed that this is because there is no such thing as regulated fishing in eastern Europe, and that eastern Europeans have neither respect or consideration for the environment. In reality, neither of these things are true. Certainly the law is different, but rules there most certainly are, and the authorities in the countries concerned fully recognise the environment’s importance. Culturally, fish are seen as a free or cheap food source in eastern Europe, which is what has, to some extent, caused us problems here. However, this also causes problems, you may be surprised to know, in eastern Europe too – as Angling Trust ‘Building Bridges’ Project Manager Rado Papiewski and I discovered on our fact-finding missions to Poland and most recently Lithuania. 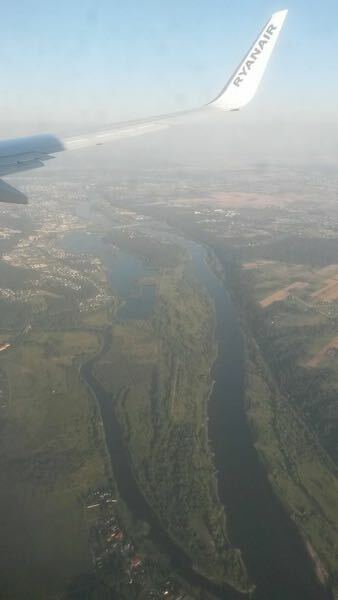 Arriving at Kaunas, Lithuania – a lovely city at the junction of two major rivers. Whilst, largely due to Rado being of Polish origin, engaging with the Polish migrant community in England has not been difficult, conversely we have had little success where the Lithuanian community is concerned. This required redress. Enter Lithuanian migrant Martynas Pranaitis. Angling Trust Volunteer Bailiff Martynas Pranaitis – a passionate angler totally committed to catch and release, both here and in Lithuania. Martynas has been in England a few years now. Having studied fisheries in Lithuania he works long hours as a baggage handler at a busy airport near London. He is a passionate angler, coarse and sea – and equally passionate about catch & release, and conserving the environment. Like Rado, Martynas, a responsible and committed angler, has sadly experienced racism when fishing in England, however. Why? 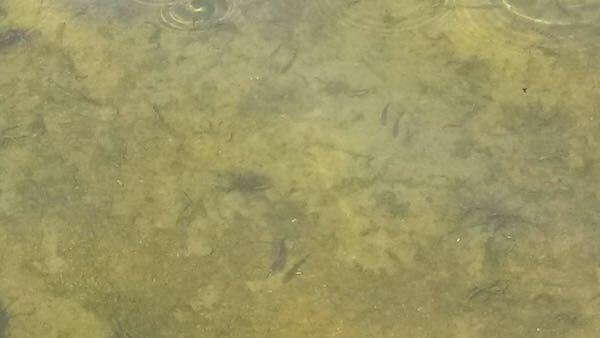 Because upon hearing their accents, some anglers naturally assume that they are poaching fsh thieves. Such an assumption is as unacceptable as killing fish. 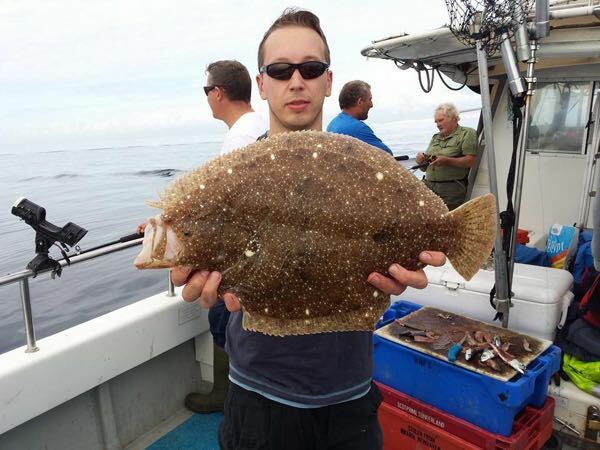 Martynas is, in fact, so committed to conservation that in spite of his long working hours he is also a valued and active member of the Angling Trust Voluntary Bailiff Service’s South Downs Area. So, just shows how wrong you can be…. Martynas is from Kaunas, the second largest city in the Republic of Lithuania, one of three Baltic states to the east of Poland, with a population of three million – and behind the so-called ‘Iron Curtain’ until 1989. Like Poland, Lithuania is a member of the European Union. In 2001, there were 5,000 Lithuanians living in the United Kingdom. Today, there are around 97,000 – so clearly engaging with and raising awareness throughout the Lithuanian migrant community can only be considered an important part of our mission – especially considering that angling is very popular in Lithuania, as in Poland. Kaunas is located at the confluence of the two largest Lithuanian rivers, the Nemunas and the Neris, and near the Kaunas Reservoir, the largest body of water entirely in Lithuania with a circumference of over 80 kilometres. So it was that whilst enjoying a holiday with his family, Martynas kindly worked very hard to set up meetings for Rado and me with some key-players in Lithuania – top marks. Martynas met us at the airport and whisked us off to our hotel, in what is a lovely medieval city, largely undamaged by the ravages of World War Two. Interestingly, we discovered from our guide that permission to fish is required in Lithuania, and that size limits also apply. The problem is, however, like in Poland, the limits protect smaller, not larger fish. Many anglers, however, can see that this is a flawed policy, and already practise catch and release – again, as in Poland. 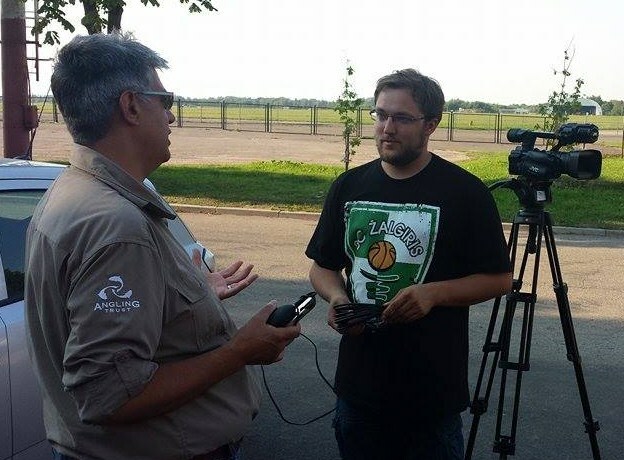 Martynas Pranaitis (left) with Angling Trust ‘Building Bridges’ Project Manager Rado Papiewski upon our arrival at Kaunas. On the morning of Wednesday 5 August, we got straight to work by meeting none other than Mr Linas Jonauskas – the thirty-four year old Minister for the Environment – and Dr Skirmantas Pocius, the Regional Director of the Aplinkos Aspaugus (Environment Agency), with his Chief of Nature Protection, Tomas Barkausas. These officials immediately impressed me: entirely receptive to our visit and to helping us, and – like us – passionately dedicated to conserving and improving the environment. Mr Jonauskas agreed entirely that a policy more focussed on catch and release was entirely beneficial, explaining that he had championed a programme to reintroduce lnyx into Lithuania – so successful was this project that there are now 100, not twenty, lynx in-country. He also agreed that the prospect of British anglers travelling to fish in his country – where there apparently remains an abundant population of big fish, in particular salmon, catfish and zander, represented an economic advantage. He was previously unaware of the issues we have in England, fully appreciated the problem and pledged support. 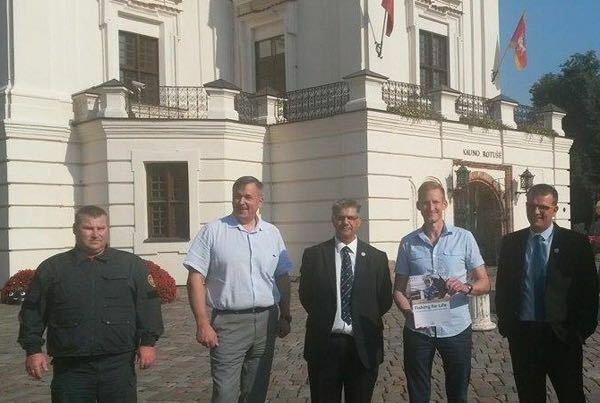 Martynas, Rado and Angling Trust Head of Enforcement, Dilip Sarkar MBE, meeting with Mr Linas Jonauskas, Republic of Lithuania Minister for the Environment, at the regional headquarters of the Asplinkos Aspaugus in Kaunas. Clearly another man of action, Mr Jonauskas’s help was immediately forthcoming in briefing the Lithuanian Ambassador in London and bringing the editors of the migrant press in England onside. More top marks. The Minister then gave up more valuable time by attending our presentation to angling clubs and anglers at the superb Kaunas natural history museum. The interest in our visit and message was encouragingly positive – and those present promised to help us educate their brethren regarding our angling law and culture, so that this is understood before fishing in England. 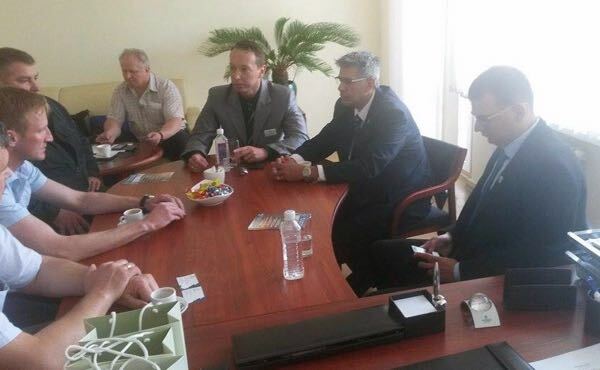 From left: Tomas Baarkausas, Chief of Nature Protection; Dr Skirmantas Pocius, Regional Director; Dilip Sarkar; Mr Linas Jonauskas, Minister for the Environment, and Rado Papiewski. 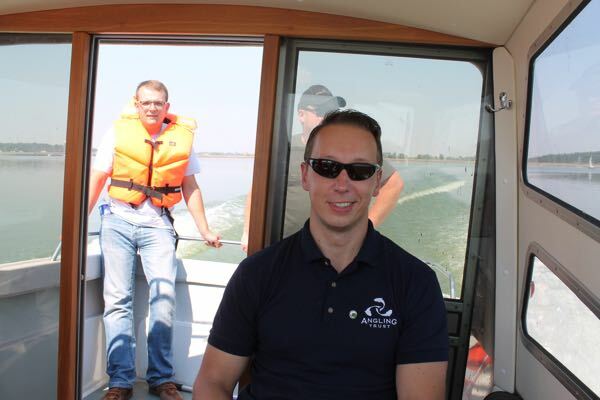 Next we were off with Tomas Barkausas, Chief of Nature Protection, for a patrol on the Aplinkos Aspaugus unmarked patrol boat at the enormous Kaunas reservoir. Over 80 kilometres in circumference, the lake was, needless to say, packed with features enough to set any angler’s pulse and imagination racing – and there are plenty of fish too, including big cats and zander. At 30 metres deep, lure fishing is the preferred method, from boats, but poachers cause problems with nets in particular. 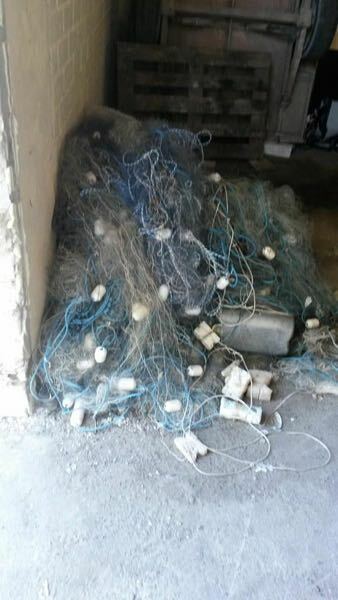 These nets are located with a sophisticated fish-finder, then the boat trawls round the area with a grappling hook until the net is caught and removed. 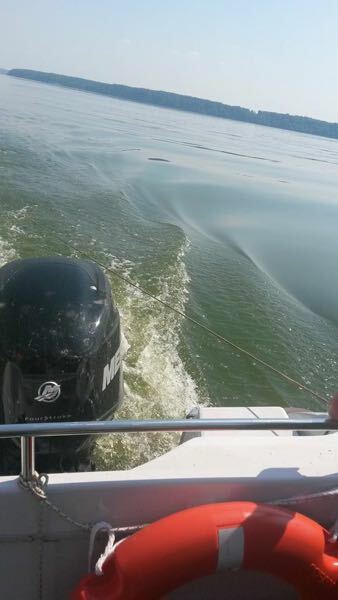 Trolling with a grappling hook for a gill net. Again as in Poland, the poaching here is on a big scale – not by anglers as such but by Organised Crime Gangs removing fish in large numbers. 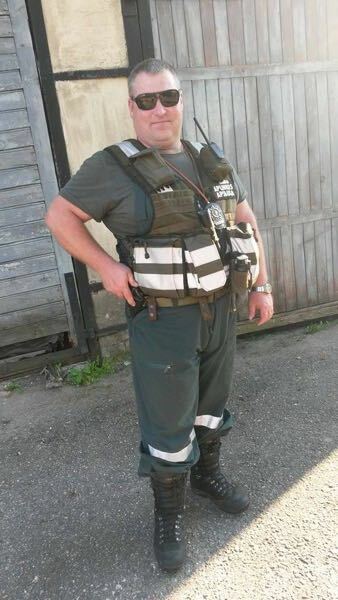 Clearly this is an ongoing issue for Tomas and his 60 armed officers – backed up by 700 volunteer bailiffs. This is identical to the approach in Poland, where the 400 armed PSR officers are supported by 5,000 volunteers. In both countries there is an excellent working and intelligence-sharing relationship with the police. 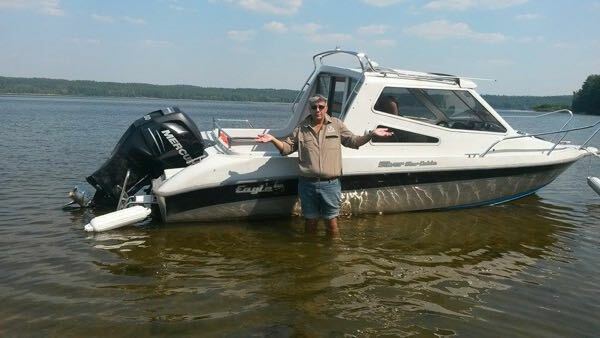 You couldn’t make it up: stranded after the patrol boat ran out of petrol owing to a faulty fuel guage! After what turned out to be an eventful voyage, due to running out of petrol owing to a faulty fuel gauge, we eventually returned to shore. At nearly forty degrees Celsius, mind, it was hard to believe that Lithuanian winters reach minus thirty – and that this huge water is frozen so solid that lorries can be driven across it! Paddling in Kaunas reservoir amidst vast shoals of zander fingerlings. In Lithuania zander are highly regarded as a sport fish. Martynas Pranaitis, an Angling Trust Volunteer Bailiff, who organised our meetings. 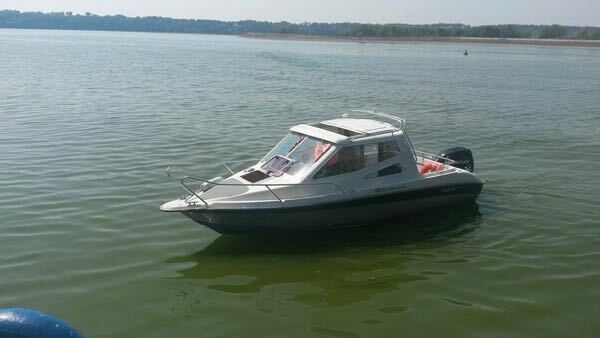 Rado enjoyed the boat trip so much they he now wants a jet-ski – and with safety in mind has not just a lifejacket but what appears to be a complete life raft firmly strapped on! We then visited Tomas’s headquarters at a disused military airfield near Kaunas. In the old hangars are stored the Aplinkos Aspaugus’s equipment – and a vast array of items seized from poachers, including nets, fishing tackle, various barbaric-looking spears, and boats. Chief of Nature Protection, Tomas Barkaukas ready for an anti-poaching patrol taking place that night – armed, amongst other things, with a Glock semi-automatic pistol and CS spray. “Is it dangerous work?” I asked one of the officers. “No”, he replied, “not really – we just set Tomas on them!” Now, that, given that Tomas is built like a grizzly bear, would be a scary prospect indeed. Clearly a good man to have onside! 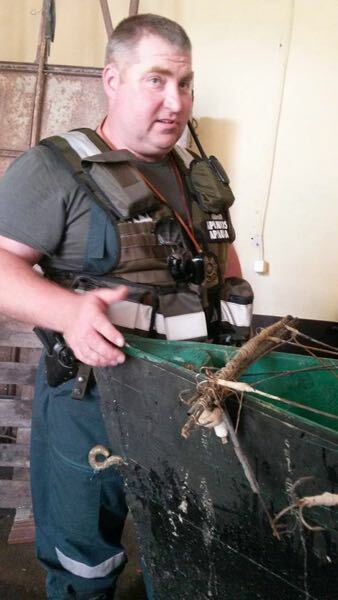 Tomas showing a barbaric instrument his officers seized from poachers recently. A huge gill net seized by Tomas’s men. Dilip Sarkar explains on Lithuanian national TV the issues we have in England caused by some migrant anglers – and why we must work together to resolve this issue. Martynas Pranaitis explains on Lithuanian national TV the situation in England as he sees it from the perspective of a Lithuanian migrant, passionate angler and an Angling Trust Volunteer Bailiff. So, progress on all fronts – which is exactly the way I like it. Having now visited Poland and Lithuania, what I think is this: there is clearly an appreciation of the benefits of catch and release in those countries, and the situation over there will ultimately change. Indeed, many anglers have embraced this concept voluntarily. Moreover, there are people dedicated to conservation and working very hard to improve and protect the environment. So, it is not at all the case that all eastern European anglers kill fish, even in their own countries, and nor do eastern European peoples have no regard for the environment. In my opinion, many of the migrants causing problems here are the very same who would be committing offences in their own countries. The same people, therefore, are causing problems for the PSR in Poland, the Aplinkos Aspaugus in Lithuania, and our enforcement agencies in England. That is why we must all work together on this, and in England join up our thinking and get the courts onside. This is happening. Increasingly. But it does take time. The majority of migrants can be educated and will comply, of that I am convinced. The issue of transient workers is more difficult to resolve – but we must keep the faith and crack on. One thing I do know: young men like Rado Papiewski and Martynas Pranaitis are positive examples of eastern European migration and are both a credit to their communities – and angling. I am proud to know and work with both of them. 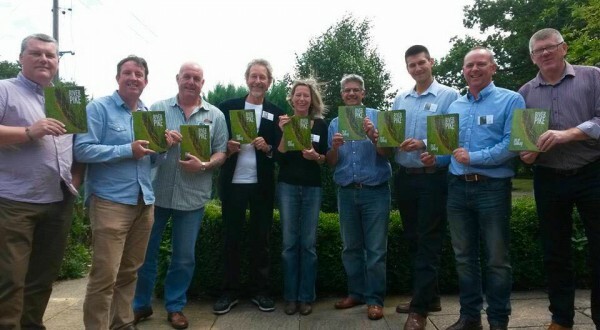 Dilip Sarkar MBE, Angling Trust Head of Enforcement, 10 August 2015. It’s A Funny Old World ! Glocks and Kalashnikovs: Fisheries Enforcement Polish Style! Taking Our Issues to Westminster! ← Operation LEVIATHAN – and more PROGRESS!